Customer: "Sakhalin Energy Investment Company Limited"
In 1998 JV LLC «Sakhalin-Shelf-Service» won tender for establishment of onshore supply base to support 1st stage of “Sakhalin-2” project in “Kholmsk Marine Trade Port” in the Southern harbor of Kholmsk Port. In 2000 dredging was done in the Southern harbor in order to achieve required level of onshore supply. For the first time in the history, this unique work allowed ice-class vessels with 8,5 meters drought access the port. Due to it, the company is able to provide all year round onshore support of “Molikpaq” platform and all oil production complex “Vityaz”, working for “Sakhalin-2” project. In 2006, the company started providing onshore supply services for marine geological works in Kholmsk Marine Trade Port for “Sakhalin-3” project under exploration of Veninskiy block, implemented by NK “Rosneft” in close cooperation with Chinese company “Sinopec”. Within the period from 1998 until 2005 Kholmsk Supply Base was located on the territory of Kholmsk Marine Trade Port. 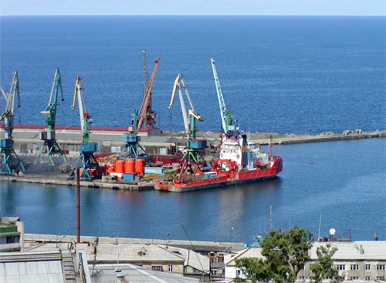 Since 2005 and until the present moment Kholmsk Supply Base is located on the territory of Sakhalin Western Seaport in the Northern harbor of Kholmsk Port. Today, Kholmsk Supply Base provides wide range of services to support all shelf projects in Sakhalin region.